David Rolf, Founding President of SEIU 775, sent out this email yesterday to a broad group of stakeholders. It announces his retirement from the union as a result of term limits. In 2002, I became the founding president of SEIU 775, the union for home care and nursing home workers in Washington State and Montana. Having started organizing right out of college in 1992, it had been an incredible privilege to lead two historic union organizing victories early in my career – the campaign to win union recognition for 74,000 Los Angeles home care aides in 1999, and 25,000 Washington home care aides in 2002. But then becoming an elected labor leader in a major union at the age of 33 was the honor and awesome responsibility of a lifetime. At the end of this month, I’ll be turning over the leadership of SEIU 775 to my successor, Sterling Harders. Not because I’m retiring from the workforce (I’m 48, healthy, and certainly not wealthy) and not because our members are seeking different leadership. I’m leaving because, back in its infancy, our union had the foresight and courage to adopt term limits for its top elected leaders. And so for me, leaving the best job any organizer or activist could ever have will be an act of conscience, of joy, and of personal and organizational renewal. I couldn’t be happier, or more proud. It is an honor to have Sterling as the next President of SEIU 775. And over the course of her fourteen years in the labor movement, I’ve known Sterling first as a promising young union staff member, later as a steel-nerved organizer of private sector workers and perhaps the most talented field campaigner I’ve had the privilege to work with – and always as a strong union sister and a friend. After fifteen years as the elected leader of SEIU 775 (and three years before that as the director of the campaign that created the local and as the appointed president) – I can’t imagine a better or more qualified leader to whom to pass the torch at SEIU 775 after what has been a total of eighteen years. If all is right with the world, Sterling will do better than I did, learn from my mistakes, accomplish more, and through the unity and strength of workers, win bigger and bolder victories than we have so far imagined. Along with Sterling, Adam Glickman has been re-elected as Secretary-Treasurer, and many of you already know him from his great work in that role. In addition, 775 has two new Vice Presidents: Andrew Beane and Memo Rivera, who have been longtime staffers working on political and organizing programs. It’s a fantastic leadership team and I’m excited to see what they’ll do next. Your support, friendship, and solidarity has been one of the pillars on which we’ve built our Union and how we went from being a small group of scrappy caregivers making a little over $7 an hour with no benefits to being a 45,000-strong powerhouse of members who doubled wages and won healthcare, retirement, paid time off, and professional training. So as I leave this position behind: Thank you — from the bottom of my heart — for all that you’ve helped us achieve through the years. You have made profound changes in the lives of members who work hard every single day to protect and care for our society’s most vulnerable people. That doesn’t mean you’re off the hook, yet: We still have a long way to go before caregivers are earning what they deserve and before we’ve built the kind of community we all want, and I know that Sterling will be calling on you to keep fighting by 775’s side. 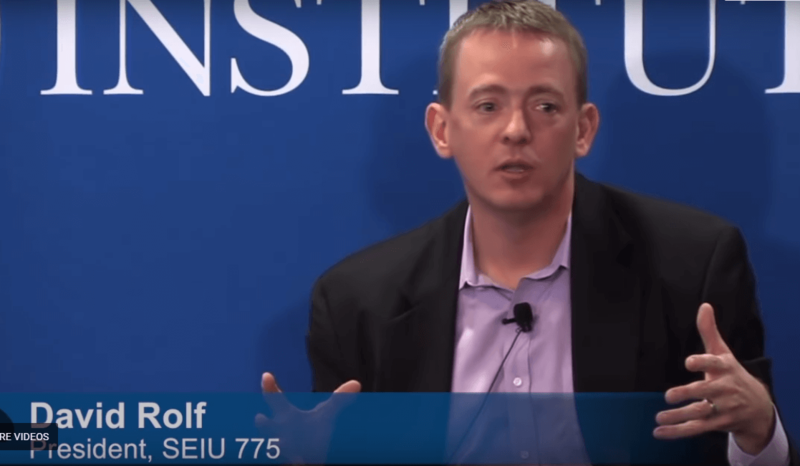 Though I’ll be leaving SEIU 775, I won’t be going far: I’ll continue to serve as President of Working Washington and the Fair Work Center, member of the Aspen Institute’s Future of Work Initiative National Advisory Council, and participant in the Harvard Law School “Clean Slate” project on the future of U.S. labor law. I’ll also continue to serve as chairman of the SEIU 775 Secure Retirement Trust, and chairman of technology startup Carina (which provides job-matching services for home care aides). I’ve got a few other things up my sleeve as well, and I’ll get you more details soon, including additional university-sponsored projects and a new collaboration with Seattle entrepreneur Nick Hanauer on rebuilding the American middle class. Thank you again for all that you’ve done – and all that I know you’ll continue to do — to help make the world a better place. I look forward to working with you again.